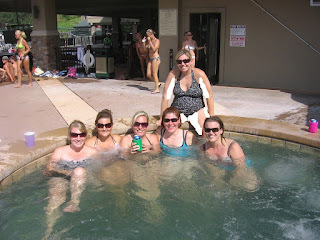 This weekend my college friends and I traveled to Planet Ozark for our annual girls trip. And yes, I don't know how to use The Photoshop so I had to trim the fat off of myself in this picture using the eraser button on my photo editor. Not that I have any problem in the world with a group of guys in a pool drinking pink frozen drinks together, but I'm pretty sure that night they were all sitting in their hotel room wondering why they never score with any awesome chicks. It took us seven months to plan this trip. Let me repeat that. SEVEN months. And over 100 emails. OVER. ONE. HUNDRED. EMAILS. For eight people to plan a weekend. Emails so painful that there were times when I would read an email then calmly walk over to the wall and beat my head against it. When did this become so hard? I used to get together with this same group of people on a weekly basis to watch Friends. Now we get together twice a year, at Christmas and for one weekend in the summer, give or take the occasional miracle when the planets align and maybe half of us can get a babysitter on the same night so that we can shovel a 15-minute dinner in our faces. And even with SEVEN months notice there were still a few who skipped out on Sunday's outlet mall shopping extravaganza because they had kid commitments and the Mom Guilt was too much to bear. What's all this talk about Mom Guilt and does it make me a bad Mom if I don't experience it? Ok, but what if I experience the opposite of Mom Guilt and peel out of the driveway swinging my shirt around my head like a lasso? Anyhoo, the minute everyone arrived at the hotel (we had to take five separate cars due to schedule conflicts) the planning frustrations disappeared and it was poop-your-pants laughery for 36 hours straight. Which came as a big relief to me because I must admit I was a little nervous about the soberness that this baby has saddled me with. Usually everyone (except the DD, of course) has cracked open their first vodka before they're finished packing and the fun doesn't stop until our heads explode on Sunday morning. 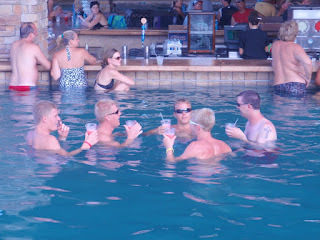 But I must say that it was refreshing to be the only one not waking up in a pool of my own vomit. And my pregnantness secured me a spot on the bed vs. the pull out couch. Score. I didn't even make it to the pull out couch. I opted for the floor...The older I get the harder it is to move once I "hit the wall" in this case it was the floor. One of the few perks of being pregnant is that I get to pull the "pregnancy card" every once in a while. It's nice for things like sleeping situations and drive-thru lines.